Pen Pals & Picture Books: Yo Mama! So, once upon a time--last year, actually--we were organized and we had a post all ready with books about moms and we put it up enough in advance so you could actually try to find those books before Mother's Day and read them with your kids and stuff. This year (and I can't speak for Robyn here, but) the only thing I have organized is my coloring drawer, and that's because I just did that this week. This book was childhood favorite of mine! My mom read it to me all the time and now I have the copy she used to read to me, so that makes it even more fun to read to my kids. You know what I would really love for Mother's Day? I should preface this by saying I only really want ridiculous things like closets and laminators. He means another kiss, but she goes searching and searching for another mother for him...it's funny. Now maybe a Mother's Day treat. 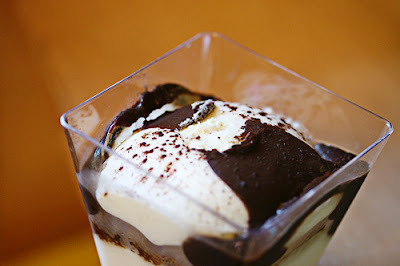 Have you ever had one of these Tiramisu Parfaits from the Barnes & Noble Cafe? I love them! They are so delicious and I like that they don't taste like coffee, which kind of ruins tiramisu for me sometimes. Do you all have any big Mother's Day plans? In honesty, I'm really hoping my kids give me the gift of 'no whining' for one whole day! That'd be the best present ever! !